I hate dry meat. 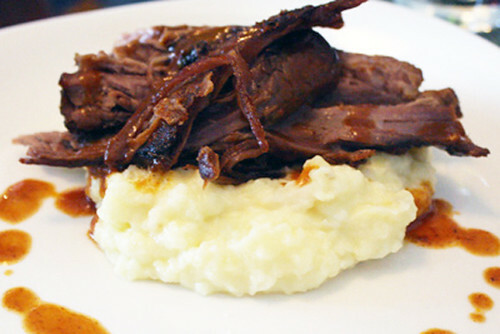 Most of the time reheated chicken, pork chops and even steak make we want to gag; it’s like chewing on wet cottonballs. So when it comes to leftovers, I prefer to eat things cold. Sometimes I may take this too far (fried rice? 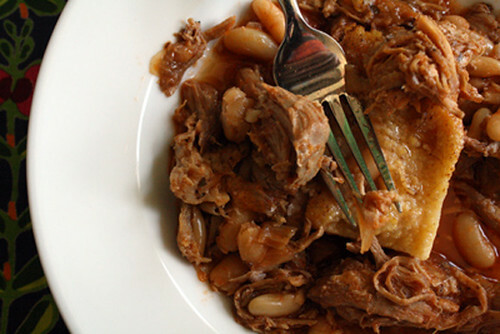 ), but other times it yields something as delicious as the original dish. 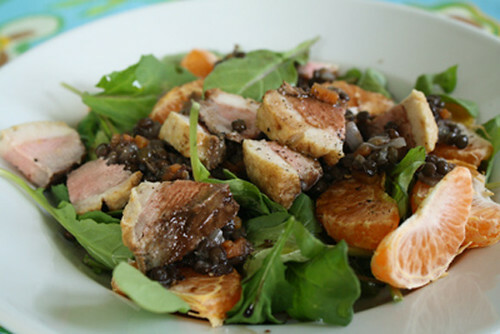 On Tuesday, I posted a recipe for Duck with Murcott Tangerines and Beluga Lentils. 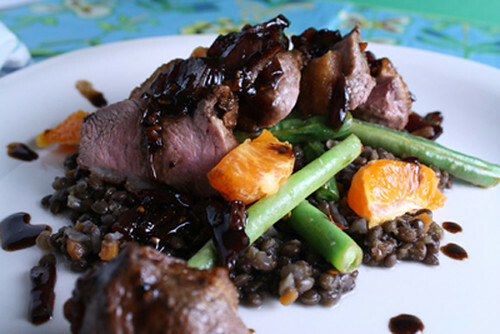 Since it’s just Neal and I, a dish like this (which serves four) yields a couple of days of leftovers, I decided to cut the duck into bite-sized pieces, toss it all in a bowl, including the lentils, with some baby arugula, fresh Murcott segments, a drizzle of olive oil and the leftover balsamic reduction. It was so good the first time I had it, I packed the leftover leftovers to bring up to San Luis Obispo for a pincic lunch! I’ve been sitting here all afternoon trying to come up with a story you’d want to read, some literary sustenance about today’s recipe. I’ve been inspired by the recent emotional and personal outpouring of my friends and fellow bloggers White on Rice Couple and Foodwoolf, but the honest truth is this: There is no story; the duck was on sale. I don’t buy duck often, though not because I don’t like it. I find it challenging to cook, a pile of inedible fat and oily meat if prepared improperly, and too expensive to screw up. 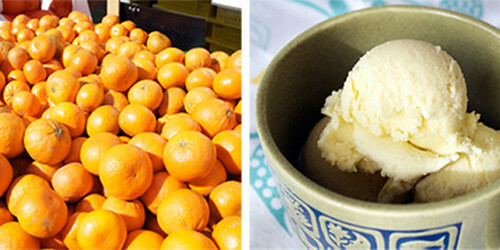 So with duck on sale at Whole Foods, and the vision of the Murcott tangerines* from Burkart Farms littering my countertops like freckled orange golf balls, I headed home—a cook on a mission. We all have bad habits. I’m a piler and a procrastinator. I have trouble recognizing when I’m supposed to give the “short” answer to a question. And I tend to buy the ingredients for a recipe without actually reading the directions. This final habit has caught me more than I’d like to admit staring at a recipe an hour before dinner that tells me I should have started it the night before. Or worse, I’ve gotten half way through preparing something only to discover that I am then supposed to let it sit for three hours to set or that I should refrigerate it overnight. Mishaps like these leave me scrambling and, while they can inspire creative solutions (like packing custards on ice to set them faster), the results are usually less tasty, texturally challenged or complete failures. Those are the nights we eat frozen Trader Joe’s spinach pizza. You are currently browsing the archives for the Season: Winter category.